1. Preheat the oven to 220°C, gas mark 7. 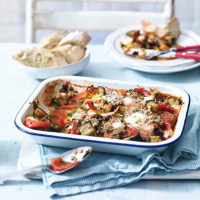 Place the aubergines, peppers and butternut squash in a large roasting tray so they sit in a single layer. Spray with olive oil, sprinkle with seeds and roast for 20-25 minutes, stirring once or twice until the vegetables are just tender and the aubergines are lightly browned. 2. Meanwhile, place the passata and spinach together in a pan and heat gently, stirring until the spinach has wilted. 3. Layer the vegetables and passata mixture into a large ovenproof serving dish, scattering with cubes of mozzarella as you go. Sprinkle the top with Parmigiano and bake for 15 minutes until bubbling and lightly browned. Serve warm with crusty bread for mopping up all the sauce. Try making your own garlic bread to serve with this - rub a cut clove of garlic over sliced rounds of bread, drizzle with olive oil and bake in the oven until nicely toasted.